In less than three weeks, Afghan voters — still reeling from one of the most violent months since the war on terror started — head to the polls for what some call the country’s first-ever truly contested election. Two candidates, former Foreign Minister Abdullah Abdullah and former Finance Minister Ashraf Ghani, have emerged as the top contenders among the dozens hoping to unseat President Hamid Karzai, who has led the country since shortly after the 2001 fall of the Taliban and is seeking re-election. Abdullah and Ghani spoke to CNN’s “Fareed Zakaria GPS” on Sunday, expressing disappointment with the current administration in Kabul and what they hope to accomplish if they win the August 20 election. Karzai “turned out to be a very poor manager, in the sense that he could not deal with issues in a manner that would respond to the needs and aspirations of the people and create a sense of momentum,” Ghani said. 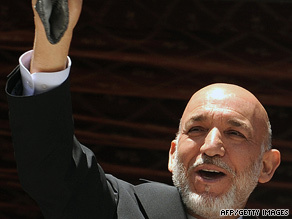 “The other side was his tolerance for corruption that grew into a massive disease, into a cancer that’s eating through the society.” He noted that Afghanistan’s government has been ranked by the Brookings Institute as the fifth most corrupt; the center of drug production; and “a place of disenchantment of the population with this government.” He blamed what he called Karzai’s “bad governance” for the return of the Taliban force — not a military or ideological resurgence. “I have talked to a lot of people in the south, where the heart of the insurgency is. And time and again, their story comes to one thing: an injustice that could no longer be tolerated and forced them to active resistance,” Ghani said. Earlier this year, Karzai said in an interview that if he wins another five-year term, he will put a special emphasis on building dams and bringing electricity to the Afghan people. A U.S. government assessment determined that less than 10 percent of Afghans have access to electric power.